In continuous manufacturing process, like pulp and paper manufacturing, high level accuracy demands high level of reliability and maintenance predictability for machines and equipment. As a very energy intensive business, the demands on energy efficiency are highly valued when considering new technologies. Interruptions in processes are expensive and all maintenance is planned carefully with tight schedules. Powerflute has invested in production quality and quantity for years to meet the needs and demands of their food industry customers. Choosing the 100% oil-free Tamturbo compressor for oxygen production supports these goals. In 2015 Powerflute agreed to test new technology for compressed air production to ensure PSA-oxygen generator’s uninterrupted performance. TT60 pilot unit was installed in February 2016. 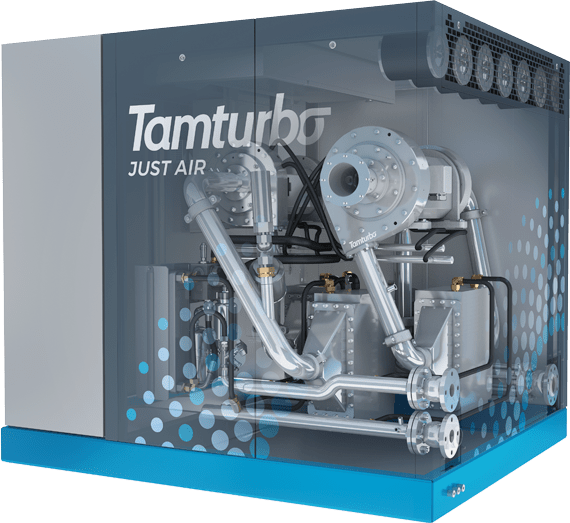 As a part of Tamturbo’s low pressure compressor product family, the TT60 offers an optimized solution for this oxygen generation application to achieve remarkable saving in energy costs and Life Cycle Costs. It is most important for us that compressors are reliable and energy efficient and easy to maintain, i.e. they have low total cost of ownership. oxygen production. The key requirement is no oil contamination in the zeolite which is used for oxygen separation. The old solution was based on an oil-lubricated screw compressor which had challenges in Oxygen generation pre-filtration. The oil carries over from the compressor blocked the filters and deteriorated the oxygen generation productivity. Changing the filters was an alternative solution but an increased need for maintenance and the associated costs were unacceptable. Tamturbo® TT60 was an excellent solution for Powerflute. Completely oil-free compressor keeps the process going uninterrupted without risk of oil contamination blocking filters. Remote monitoring and inclusive sensoring informs how compressor is working and helps to schedule the maintenance. Literally only components that need regular maintenance are intake air filters and two seal kits. All maintenance procedures can be optimized with the production process without need for excessive interruptions. Tamturbo compressor has proved its efficiency – Powerflute gets substantial savings in electrical, service and maintenance bills, as well as in indirect costs.